ATM Money Machine Inc. was started in 1996. Over the next few years we experienced quick growth placing hundreds of ATMs primarily in the Northeast in many diverse places from Maryland and Jersey boardwalks to The Statue of Liberty. In 1999 we expanded to become direct processors, signing agreements with every network in the country like Visa, MasterCard, and American Express. This is important because with our direct processing, and our interactive ATM management site, we able to offer our clients the most comprehensive and least expensive processing rates in the country. Soon we began with many top line Hotel management groups like National Purchasing Network providing ATM service to their hotels. From there we began providing free placement ATMs for chains and mall operators. We then began to diversify into ATM banking, management, and service. We developed a program with many prominent Banks and Federal Credit Unions that was simple and yet very effective. We replace their old ATMs with our new state of the art ATMs. For these clients we supply virtually all their services such as the ATMs, all processing and management, and even cash. We do all of this at a cost to them that is more often than not lower than just what they were paying monthly for service alone! We literally save these Credit Unions and Banks hundreds of thousands of dollars every year while freeing up many of their employees that used to work on the ATMs to do other jobs. As our merchant portfolio grew our reputation as the best ATM distributor and processor continues to grow. We don’t take that title lightly. We prove ourselves every day to our clients and we pledge we will do that for you. Whether you’re a merchant in need of a quality ATM at the lowest price, or run a Credit Union or Bank that wants to save money while offering your customers fantastic customer service, or even someone that owns malls or hotels or just someone that wants to start an ATM business we know that ATM Money Machine Inc. offers you the best processing and management service which lead you to highest profits in our industry. I highly recommend the services of ATM Money Machine, Inc. ABCO Federal Credit Union has utilized their services for more than 7 years. As a financial institution, it is critical that we provide excellent service and products to our members. The products and services provided by ATM Money Machine are supported by an excellent service department. They are available on-call 24/7. ATM Money Machine, Inc. is a well run company that has time and again not just met, but exceeded their contractual agreements with us. I give them my highest recommendation. ATM Money Machine has been in business for over 21 years. Our most important goal at ATM Money Machine is to provide the customer with the best possible customer service. The sale of the machine is just the first small part of your relationship with ATM Money Machine. We want to see the customer succeed, and will help them any way possible to ensure they do so. The staff at ATM Money Machine is kind and helpful, and is always able to be reached. There are no automated systems when calling ATM Money Machine. Every employee of ATM Money Machine feels passionate about what they do, and even more passionate about giving the best possible customer service to their customers. At ATM Money Machine you receive Free 24/7 technical & customer support and you receive the surcharge profits off of your ATM. ATM Money Machine sets you up with a website to monitor your ATM from any computer. There is also an app you can download on your phone. You can also get text message and/or e-mail alerts for when your machine is low on cash. We feel we have the best ATM values in the country and we’re guaranteed to never be undersold – we’ll beat any price! ATM Money Machine offers free parts, labor, and supplies for 5 years available to all clients. We supply our customers with speedy, direct shipping. ATM Money machine has a perfect standing with the Better Business Bureau. ATM Money machine services all 50 states. ATM Money Machine provides prompt payments to you, as well as on screen and receipt advertising. We provide onsite installation and training. ATM Money Machine also offers a guaranteed ATM buy back program. Give us a call today to see why our customers say we offer the absolute best customer service out there! The average ATM customer will spend a substantial portion of site-accessed money with your business. ATM users are habit-driven, often using the same ATM repeatedly, bringing repeat customers back into your business. ATM machines bring customers to your business so that they may access the ATM. ATMS provides ultimate convenience to your customers. Having an ATM machine saves your business from having to take checks. When you have an ATM machine, you can eliminate credit card charge backs. Saves your business the percentage you would normally pay the bank on credit card transactions; it generates income with every transaction. ATMs attract more customers, increases sales, and reduces bad check losses to zero. Even with debit and credit cards, cash will always be king. With the increasing costs for businesses to take debit and credit cards, many businesses are looking for an alternative to taking plastic. Rather than paying someone a percent of your sales, why not make money and have cash being spent in your business. Having an ATM machine in your business not only will save you the money you spend on credit card processing, but you also make money off of having an ATM machine in your business! When you purchase or lease an ATM machine from ATM Money Machine, you get to select your surcharge amount. Every time a customer uses your ATM machine, you keep 100% of all the surcharge revenue profits. Your customers can make withdrawals on your ATM by using a debit card or a credit card, and can also check their balances on the ATM. You get to select what denomination you use in your ATM. ATM machines are also a draw into your business. If someone walks by your business, they may come in just to use your ATM machine. When the customer takes money out of your ATM machine, the cash retention rate is 35-40%. That makes that someone using your ATM machine will spend 35-40% of the money they just took out of the ATM machine and spend it inside your business. You’re bringing in new customers to your business all thanks to your ATM machine! Also, by having an ATM machine inside your business, you’re eliminating the risk of having credit card charge backs. Rather than accepting checks, and running the risk of them bouncing, you can have your customers use your ATM machine. This way, you don’t loose the customer and gain cash without the risk! ATM machines are very easy to work, and we set you up with a technician to train you on how to work all aspects of the ATM. If you’re having any problems with your ATM machine, we have a 24/7 technical support line to help you with any ATM related problems. Worried about time management? It only takes about 3 minutes from start to finish to stock an ATM machine with cash. ATM machines require very little time. In total, about 10 minutes a month would be necessary to be spent on your ATM machine. You can make thousands of dollars a month with only 10 minutes of work by having an ATM machine! We also offer signage for your ATM machine to bring more people into your business to use your ATM. We handle all the processing of your ATM machine! You simply purchase or lease the ATM, and collect the monthly surcharge revenue profits off of the ATM machine. We have customers making thousands of dollars a month by having an ATM machine, and that doesn’t even include the new cash spending inside their business. How will I know if my machine will do well? The main thing you have to look at is how many people come into your business a day. The average usage a day is anywhere from 4-8% of people that walk by the ATM machine. Therefore, if you have over 150 people coming in your business a day, you could have between 6-12 uses a day on your ATM machine. If you set your surcharge on your ATM machine at $2.95, which is what most banks charge to use their ATM, you could be making between $530-1,100. A majority of our customer’s average at least 300 ATM uses a month. Some of our customers see well over 2,000 transactions a month on their ATM machine. It all depends on how busy the location is. The way to determine how many transactions your ATM machine will do is to take the amount of people walking into your business and multiplying that by .06. Most restaurants see at least 300 people a day, giving your ATM machine close to 20 uses a day. Keep in mind; you will also see a majority of the cash being withdrawn out of the ATM machine spent inside your business. So not only are you making a profit off of the surcharges on the ATM machine, but you’re also going to see more cash being spent inside your business. And as we said before, CASH IS KING! For the most reliable and highest quality ATMs, nothing beats a Triton. A trusted leader for affordability and service for 30 years, Triton continues to set new standards with innovative features and support after the sale. Triton ATMs are made in the USA. They build them from the ground up at our state-of-the-art manufacturing plant in Long Beach, MS to provide you with the lowest total cost of ownership in the marketplace. With a sleek look and a small footprint, Triton ATMs have a great modular design which makes them easy to upgrade. Triton ATMs are easy to service and have the least amount of downtime of any ATMs on the market. And, thanks to superior engineering, most Triton ATMs average less than one service call per year, with most technical difficulties reported resolved by telephone. Since their founding in 1979, Triton has long been known as an innovator.. They learned that Triton not only has the technological expertise to solve problems, but also has a rare passion for developing technology that makes sense — solutions that are as practical and affordable as they are sophisticated. Triton’s newest ATM model is the Triton Argo which comes in a 7” and 12” screen size. They also currently manufactuer the Triton Traverse. Some of their used models we carry are the RL1600, RL2000, RL5000, and the FT5000. With over 28 years of experience in the industry, Nautilus Hyosung has been technology leader in ATMs and other self-service solutions. With its vertically integrated business structure, Nautilus Hyosung is able to effectively integrate its software development capabilities with its sound hardware manufacturing platforms with speed and flexibility. Providing complete solutions in hardware, software and electronic banking services to the financial services and off-premise markets, Nautilus Hyosung will commit to enabling maximum cost reduction, security and creating new business opportunities for our partners. Nautilus Hyosung’s Quality management Vision is to grow into a Global Top Maker that delivers World Best products quickly to customers by establishing Quality Management giving priority to quality, satisfying customers, providing best service, and achieving Global Top quality. To this end Nautilus Hyosung has an in-house organization for quality audit, standardization and quality innovation to continuously enhance quality mind and give quality training under a thoroughgoing quality assurance system, covering sales/marketing, product development, production, and after-sale service. In addition, it uses ASSIST (Advanced Service Support Information System Technology), an innovative maintenance support system to provide customers with the best service, in order to provide customers with high-quality service, thereby meeting the needs of customers quickly and correctly. Some Nautilus Hyosung ATM machines we carry are the Hyosung Halo 2, Hysoung MX 5200SE, Hyosung 2700CE, Hyosung MX 5300CE, Hyosung NH 2700T, and the Hyosung MX 4000W. 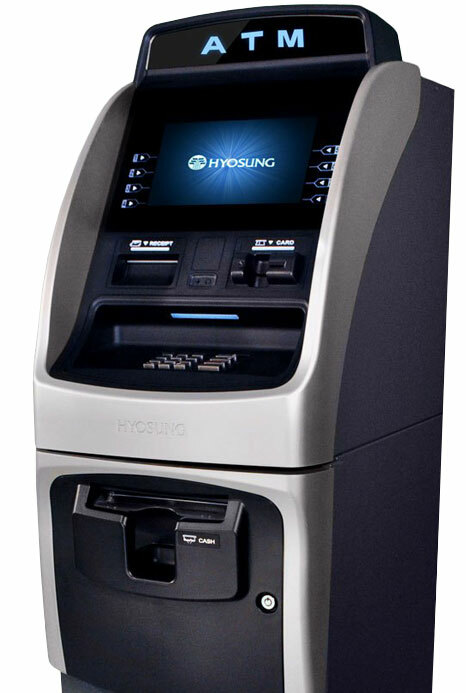 There are used Hyosung machines that are the Mini-Bank NH-1500 and the Mini-Bank NH-1800 and the Mini-Bank NH-1800CE. Hyosung offers numerous different stand alone, as well as through-the-wall ATM machines, and our company, ATM Money Machine carries every type. Since 2006 Genmega ATM Machine has been a manufacturer and provider of ATM and Transactional Kiosk solutions with well over 150,000 units deployed worldwide. Our products are built on a philosophy of cutting-edge engineering and integration wrapped in attractive, modern designs which are not only easy to deploy and maintain but also invite customers and maximize your returns. Genmega ATM products are often developed with direct collaboration and input from our customers. Our ability to take your ideas or equipment needs from concept to market and a willingness to explore options make Genmega a valuable partner. With tens of thousands of ATMs and components deployed, and a staff of engineers, developers and technicians with decades of ATM experience, Genmega knows that reliable equipment is critical to operating your business. Some of the Genmega ATM Models we carry are the Genmega G2500, Genmega Onxy, Genmega Onyx W, GT3000, GT5000, C6000 ATM. Founded in 1986, Hantle is the leading innovator of retail ATM and self-service technology, serving the retail markets. Through vertical integration of advanced R&D and manufacturing, Hantle delivers products and services for existing and emerging market needs. Hantle is committed to serving our customers’ business growth and profit. Hantle has sold and supported more than 100,000 ATMs and self-service terminals throughout North America. Since 2006, Hantle started its own manufacturing, and has shipped over 20,000 ATM and self-service terminals. Hantle headquartered in Hayward, California, became an independent operating company of Eltna Group in August 2008.Hantle was previously known as Tranax ATM. Some of the Hantle ATMs we carry are the Hantle C4000P, Hantle 1700W, Handle C4000, and the Hantle T4000. This emphasis on improving the entire product solution extends all the way to the back-end systems that are used to manage a network of ATMs. In an industry where mean downtime between failures can dramatically impact revenues and customer satisfaction, Tranax solutions are renowned for their reliability. When downtime does occur, the company’s rapid response team quickly evaluates the problem over the phone, suggests a fix, or drop ships a replacement part for delivery the next day. Because the ATMs are constructed in a modular fashion, it’s a simple matter to swap out a malfunctioning part. Tranax tracks not just the serial number of an ATM, but all of its individual parts in order to determine a part’s history and inventory. The result is a much lower total cost of ownership over the product life cycle. Hantle/Tranax offers numerous different models, and ATM Money Machine carries them all. Some examples of Hantle ATM machines are the Mini-Bank 1700, The Mini-Bank C4000, and the Mini-Bank X4000. With over 125 years of experience and knowledge, NCR is a leading global provider of payments, assisted- and self-service solutions. NCR has been the global number one manufacturer of ATMs for more than 23 consecutive years. Tailoring software and services to compliment our hardware portfolio, NCR delivers consistent, multi-channel, end-to-end solutions. NCR helps their clients around the world improve their customer interactions, implement change quickly and proactively, and transform their businesses to become leaders and change agents. How does everything all work? The program is the same regardless if you purchase or lease to own the machine. When you select your ATM, you have the option to have the ATM machine come completely pre-programmed, where all you do is plug in the ATM and it’s up and operational, or you can opt to have a technician to come out and do your installation. At the location you need a phone line or internet line to connect to, or we also have a wireless option for only $17.99 a month! Your ATM will then be connected to our processing server. You set your surcharge, whatever you want to charge to use the ATM is totally up to you. You can set it as low as ZERO or as high as $10! This is totally up to you, and that is your profit on the ATM. As far as the cash to stock the machine with- most people usually put about $1,000-$4,000 in at a time, but the machines hold as much as $16,000+. Lets say you put $1,000 in the machine, and someone comes and takes $20 out of the machine, the $20 is put right back into your bank account. If it’s taken out before 3PM it will be back in the following day, after 3pm is the day after. So the money is always being recycled through! We also set you up with a website/phone app where you can view your ATM in real time and see all transactions taking place. Owning an ATM is so simple! You have more cash being spent inside your business, as well as you make money off of the ATM rather than spending thousands on credit card fees! How much will my ATM cost and what ATM machine should I choose? There are numerous different options for ATM machines as far as pricing and features, as well as all different makes and models. At ATM Money Machine we carry all the major manufacturers of ATM machines from Hyosung, Genmega, Hantle, and Triton. All these manufacturers make all different models ranging from starter models to the through-the-wall ATM machines. There are also different mobile types of ATM machines. We offer numerous different ways of payment from leasing to out right purchasing. On all new ATM machines there are different warranty options ranging from one year to five years of parts or parts and labor coverage on the ATM. We also offer used ATM machines. We will match and BEAT any price on any ATM machine. We also offer the best customer service for our ATM machines. This question really depends on the customer. When leasing, the only money due is your first and last payment. You only need to do one transaction a day, or less, depending on your surcharge amount to cover the leasing cost of the ATM machine. Also, all of our leasing options are lease to own the machine, where at the end of the contract you own the ATM machine with only a $1 buy out! Leasing is the best choice if you don’t want to go out of pocket for much upfront. Our leases start as low as $77 a month, making it a very affordable way to own your own machine. When purchasing, it’s a one time fee and then everything after that is a profit off of the machine. We sell our ATM machines at cost, so you’re guaranteed to be paying the lowest price on the models. Regardless of what program you choose, you keep the surcharge revenue profits off of the machine. Both programs allow your business to make a large profit off of having the ATM machine, as well as generating a lot of new cash spending. Is free placement right for me? Free placements for ATM machines require the location to be a high traffic location that will do a high volume of ATM transactions monthly. How the free placement program works is that ATM Money Machine will supply the ATM machine, as well as stock the cash, and you as the business owner will receive a percentage of the profit off the machine. In order to qualify for a free placement to be profitable for the business, the machine has to do at least 500 transactions or more a month. To figure out if your ATM machine would do this amount of traffic, you have to look at how many people use the machine a day. Take the amount of people walking into your business and multiply that by .06. If the number is over 500, a free placement of an ATM machine may be right for you. However, now that the cost of ATMs has gone down dramatically, many people would rather own the machine themselves and keep 100% of all the profits. However, if you have a very busy location and want nothing to do with the ATM machine, a free placement might be right for you. Some examples of businesses that do well with a free placement of an ATM machine are: concert arenas, nigh clubs in busy locations, malls, and hotels. What if I want to be a distributor for your company? If you would like to be a distributor for ATM Money Machine, you just have to contact us directly! What an ATM distributor does is they find the location that would like to purchase or lease an ATM machine from us, and put them in contact with us. Being an ATM distributor allows you to gain a profit, without having any involvement of the ATM machine. We have a commission schedule based on finding locations for ATM Money Machine. Being a distributor is easy. To become a distributor, contact ATM Money Machine at (609)-641-7300 to get things started. What if I don’t own a business? At ATM Money Machine we have an amazing program where you can get started into the ATM business without owning a location to place the machines! When starting your own ATM business, you can place the machines in other’s locations and keep the surcharge revenue profits! Why would I want an ATM business? Do you want a business that can net well over $100,000 a year, which requires less than an hour a month of your time? I can guarantee you answered yes! With an ATM business, you need no employees or a storefront. It requires a very low start up cost. Your investment into the ATM machine can be paid back in less than six months. You can manage your ATM business from home at your own schedule. You may only have to go to the location of the ATM machine once or twice a month depending on usage and amount of money stocked in the machine! You can also own an ATM business, while still working a part-time or full-time job since it requires so little time! How do I start my own ATM business? The ATM business is a very profitable and easy business to get into! Your first and most important step is to find the locations to place the machine. Many people ask, do I have to own the business to place an ATM machine there? You do not! All you have to do is approach the business owner and see if they’re interested in having an ATM machine inside their business. Some reasons why a business owner would like a machine in their business is to lower their credit card costs, see more cash being spent, as well as to attract customers into their business just by having an ATM machine on premises. They have no responsibly of the ATM, yet get to reap all of the benefits! With credit card costs being so high, most business owners would rather see cash being spent. By having an ATM machine on premises, they will see cash being spent rather than having to take plastic! Therefore, they will see lower credit card costs and more cash spending! Once you find the location on where to place the ATM machine, you purchase the machine. ATM Money Machine will come out, install the machine, program it, and train you on how to work the ATM. You are responsible for stocking your cash inside the ATM machine, and you keep all the surcharge revenue profits. You get to select your surcharge amount. You get to select what you’d like displayed on the screen, as well as what you’d like to print on the receipt. You can use this as an advertisement for your ATM company, or you can advertise the business that the ATM is placed in. You can even sell this advertisement space! ATM Money Machine will set you up with a website where you can monitor your ATM, so you can see exactly what is happening on your machine IN REAL TIME! As soon as the machine is installed, you start making money! You can make well over $100,000 a year on 10 machines. These machines require very little time. On average, depending on how many times a month you fill the machine, you only will be spending about 10 minutes in total at the machine. It takes as little as three minutes to load the machine with cash. It’s all very simple, and you can be making more money working a few hours a year, than most people making working full time! What are my start up costs for getting into the ATM business? You can get started into the ATM business for a very low cost. For as little as $2,099, you can purchase your first machine. You can stock the machine with as little as $500 or as much as $16,000+. Most customers stock their ATM machines with between $1,000-3,000. Therefore, you can get started with your first ATM machine for about $3,000. THERE ARE NO FRANCHISE FEES! You can pay off your ATM machine in the first three months or less, and everything from then on is a profit. ATM machines can last as long as 7-8 years or more, allowing you to be collecting money off of the ATM for many years. At ATM Money Machine we suggest you start with one or two machines, and build your ATM business up from there. You can gain a good understanding of the ATM machines and how they work, and then expand your business! We have many customers who started with only one ATM machine, and now have well over 100 machines out in the field! What types of locations do well with an ATM machine and do you find the location? All different types of locations do well with an ATM machine, but the most important thing comes down to volume! Businesses that often do well with ATM machines are con stores, restaurants, night clubs, bars, malls, etc. However, the main thing to look at when trying to find a good location to place the ATM machine is the amount of people walking into the business daily. Any type of business that is busy will do well with an ATM machine. The more people walking through a business, the more usage the ATM machine will get. As far as the location, you are responsible for finding it. However, we do have a unique program at ATM Money Machine. We get hundreds of inquires a day for businesses looking for a free placement of an ATM machine. Often times, the business doesn’t qualify for a free placement of the ATM because the location is out of our service area and the armored carrier costs are just too high. What we do is we match you up with any business inquires in your area, allowing you to decide if you want to place an ATM machine inside their location! We always will pass long these free placements to you, all FREE OF COST! At ATM Money Machine, we’re always looking to help out our customers and give them new locations. What are my warranty options? When purchasing a new, state of the art ATM machine, you get a one year parts warranty on the machine. We also offer an extended warranty, which covers all parts and labor for five years. The ATM machines that we sell are very reliable, and can often be used for well over five years. We have had customers have the same machine for ten years!